BlogHome BLOG Uncategorized BREXIT AND LARGE-SCALE PROCUREMENTS – WHAT ARE THE OPTIONS? Over the past five years, staff from MainStreet have been closely involved in several complex, large-scale procurement exercises in higher education – helping Strathclyde and Oxford Brookes universities identify strategic technology partners and helping Hull, University of the Arts London and latterly Manchester Metropolitan to secure new student information systems. We have been scoping out a few more initiatives like those above. But what has been most striking about the most recent conversations is that all of those potential clients ask about the impact of Brexit on their procurement options. •	Do we have the time to go through the OJEU procedures now? Is there not a risk that we’ll be out of the EU by the time we get something in place? •	Is it in fact worth the effort? These things take many months’ worth of staff time to plan, deliver and implement? •	Indeed, is this not a good excuse to avoid all of that in favour of something ‘easier’? Will Brexit really affect procurement in the short term? While nobody really knows at this stage, there are some important things to be thinking about – now. The European Council’s Directive on Public Procurement has been accommodated in UK and Scottish Law by the current Public Contracts Regulations 2015 and Public Contracts Regulations (Scotland) 2015. By the middle of 2019, wider procurement regulations will be adopted into UK law, with European Court of Justice interpretations still being applied for an as yet undetermined period thereafter. What happens after that will depend on the negotiations with the EU on trade. Until those arrangements are agreed and the UK leaves the EU, procurement regulations will most likely stay exactly as they are until at least late 2019. And in the medium term? It depends on what the new arrangements are. If the UK were to become part of the European Economic Area (like non-EU countries of Iceland, Norway, Liechtenstein and – albeit slightly differently – Switzerland), then there is not a lot of room for manoeuvre. All of those countries are obliged to follow the principles of EU public procurement, including advertising in the OJEU as appropriate. Should the UK not join the EEA in some way, it is nonetheless still bound by its membership of the World Trade Organisation’s (WTO) Government Procurement Agreement. The GPA sets out practices for fair procurement on all members, and those cover fair, open advertising of opportunities. This could mean of course that opportunities are advertised just on UK-wide forums rather than via OJEU. 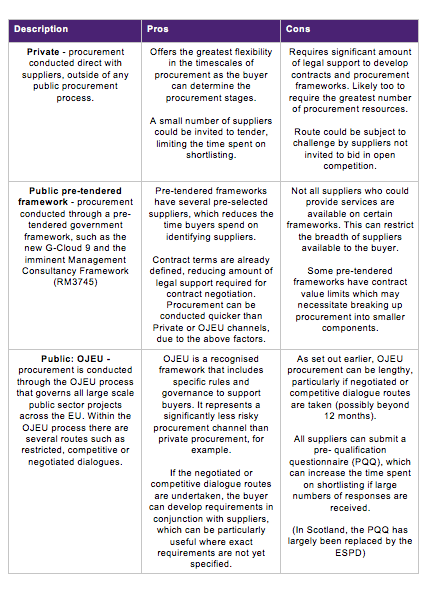 •	Will the Government really treat tinkering with its Public Procurement regime as a priority in the coming few years? It will have other priorities. Yes, OJEU processes aren’t the only routes. We now routinely say to our clients that they should get familiar with several possibilities for procurement and not just default to OJEU. And our most recent clients have used other mechanisms to contract with suppliers. Ultimately, these exercises rely on good decision-making. That clearly means picking the right supplier or partner at the culmination of a procurement but it should apply also to the decision to procure itself. Our advice to clients before they embark on a large-scale procurement has always been to do the hard work before they start the formal activity. 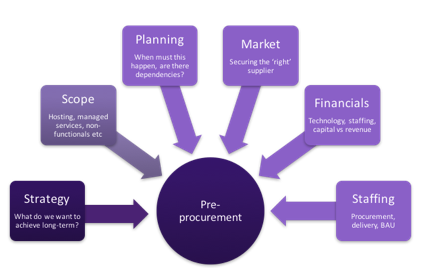 The most successful projects are those where senior staff have actively considered the prompts set out in the diagram above – allowing them to articulate the ‘why’, ‘what’, ‘when’ and ‘who’ questions – before the ‘how’ of procurement routes. MainStreet Consulting helps organisations to make big, complex decisions with confidence. To talk about our successful advisory projects in Higher Education and across the public sector, contact David Welsh on 07900 692689 or email David@mainstreetconsulting.co.uk.